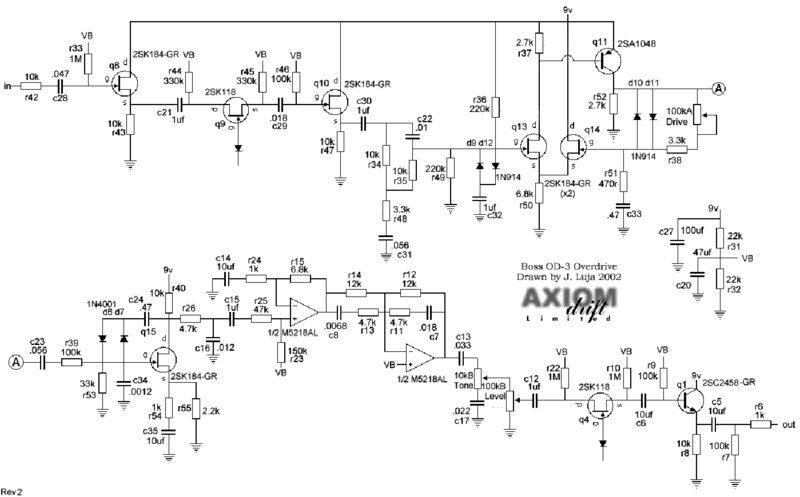 The fence that separates distortion and overdrive pedals is very thin. Usually pedals based on hard clipping, high amount of distortion and mid scooped response curve are called distortion and those ones based on soft clipping and mid boosted are called overdrive. 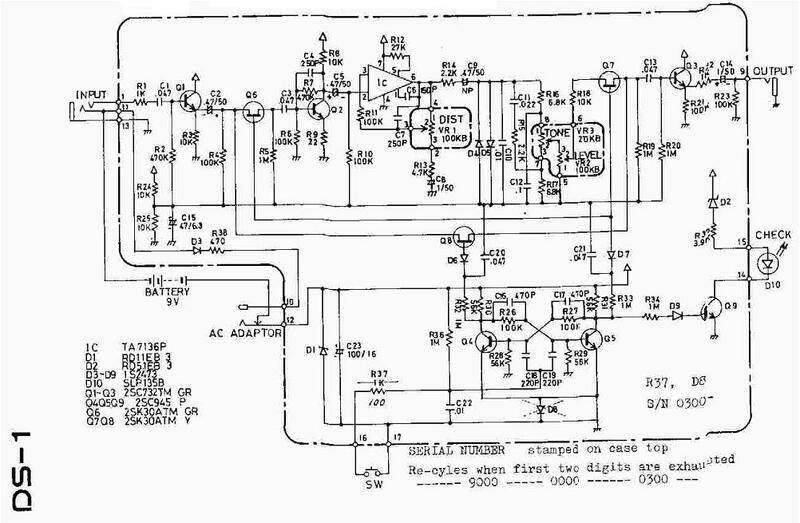 But some of the more famous overdrive pedals, known for being “transparent”, “clean” or “dynamic” are based on hard clipping (clipping diodes at the output of an operational amplifier or transistor). Think of Klon Centaur, for example (mid boosted, by the way). Hard clipping seems to have usually a more dynamic overall response to the guitar touch than soft clipping, although it depends on the circuit design. Some soft clipping pedals are very dynamic while others are too compressed, but most of them seem to be compressing and distorting all the time. Hard clipping, theoretically limits drastically the signal when it reaches a certain level, so it creates those high harmonics that give it its character. Soft clipping limits the signal more gradually, giving that “soft”, characteristic valve-like distortion sound. Having taken all these considerations into account, let’s review my last pedal modification. I wanted to experiment those concepts with a BOSS DS-1 pedal I purchased broken and then fixed. I liked as it was, but that kind of distortion is not for me, frankly. BOSS DS-1 is based on classical symmetrical hard clipping, two diodes at the output of an operational, and the tone stack tends to mid scoop the response curve, so it should be considered a distortion pedal. It is orange and is called “Distortion”, so in this case it was easy. 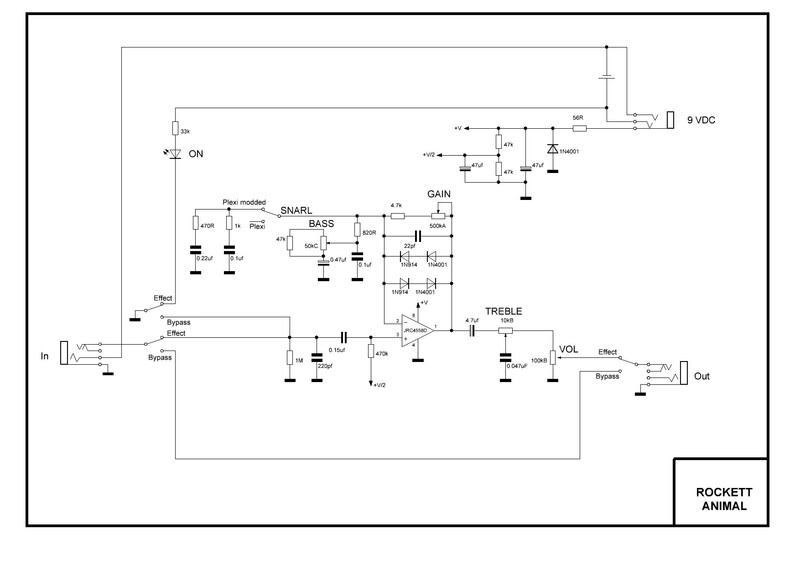 R9 at the emmiter of Q2 controls the gain of the first stage, previous to the opamp stage. With a value of 22 Ohms, the output is so high that the signal at the output of the operational is almost always clipped. I tried with different values and for me 100 Ohms gave the sweet spot for having the right amount of distortion with the gain control at 12 o’clock, for both single coil and humbucker pickups. LED diodes have a Vf higher than common bipolar diodes. Bipolar diodes have Vf=0.7V and LED have Vf > 1.5V, depending on the color. Vf is what causes the clipping, and the higher Vf is, the higher the signal can be before it starts to clip. Replacing only one of the clipping diodes (D5 for instance) by a red LED yields more headroom and at the same time serves my second purpose of having asymmetrical clipping. 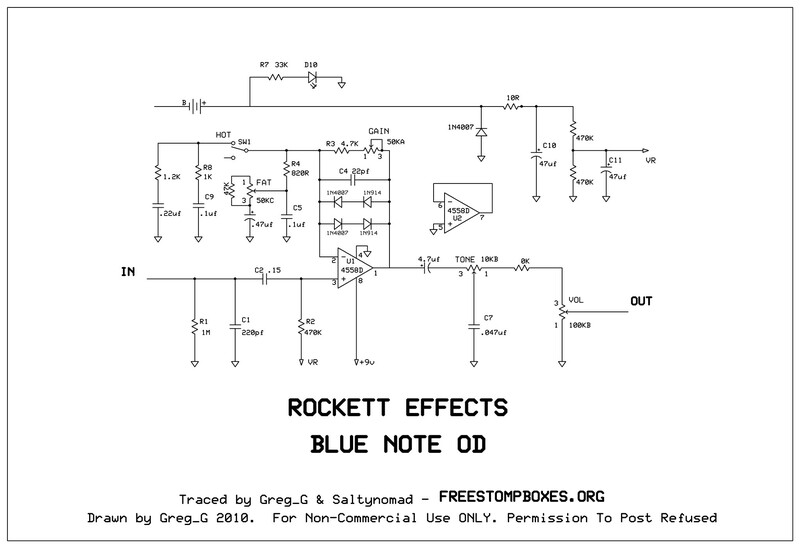 By the way, this is one of the changes that the famous Keeley Ultra Mod makes to the DS-1. For the mid boost thing, I changed several components of the tone stack. DS-1 tone stack is based on the Big Muff tone stack. It is passive and tends to mid scoop the tone. By simulating the circuit with LTSpice, I found the spot where the signal is mid boosted without loosing the ability to control the tone (although it is somewhat reduced compared to the original DS-1 design). The bump happens at 800Hz, which for me is the best point to get a nice tone that is capable of cutting through the mix in a band context. 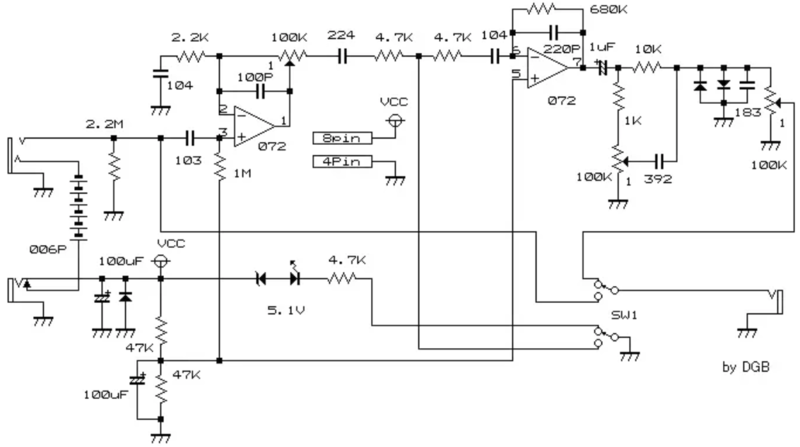 It is a simplification because the response curve of the pedal depends on the rest of the circuit as well, but I can tell you that the result is quite acceptable. The components replaced in the tone stack are C11, C12, R15 and R16. As you can se, only six components have been replaced. I have prefered to keep it as simple as posible, but the change in tone and behavior is drastical. Now the pedal is a very dynamic, mid boosted overdrive, with a wide range of distortion. With gain at max level, it reveals it true distortion spirit. Put a compressor before and an equalizer that boosts the 100Hz frequency after it, and you’ll get the real sound of rock and roll. For C12, 82nF is not a very common value, but you can put 47nF and 33nF in parallel to get 80nF, enough given the usual tolerances of capacitors. Use a capacitor tester if possible to get a close value. The board have plenty of space to put the two capacitors in that position. For C11 and C12, any kind of capacitor will do, but the values are very important (test if possible). I hope you enjoy this mod, please let me know of any improvements or mistakes you may find. If you are a good guitar player, please record a demo and upload it to youtube. If you are rich, please send me a Klon Centaur to compare with my DS-1 modified pedal.